I got the "front" part and that is why I asked before merging your thread with this one. Good luck and Happy New Year. On the '17 I am hearing that anything, like a push bar, that blocks the sensors will cause an issue. I have a Setina push bar PB400 with Whelan white strobes, and controller, built into the top bar and round driving lights mounted on the lower bracket. See photos earlier in this thread. It is for sale, but located in the US Virgin Islands. The car was written off after rodents ate the air bags and wiring. I only have the aluminum main structure available. The mounting hardware should be readily available from Setina. Make an offer. I suppose that could very well be Scott. Prior to the front sensors being added in 2016, the main concern was blocking the Adaptive Cruise Control radar unit. I am seriously considering a "Safari" vs. push bar for my Ex. 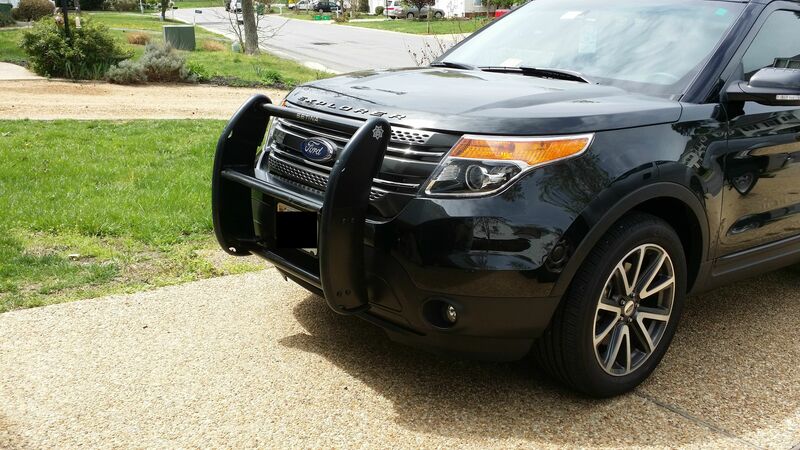 I had one on my 2005 Explorer Sport Trac mainly for off road protection and to mount my two PIAA auxiliary lights. I want to keep it low profile and not lose any front end ground clearance. I am looking at the Westin Contour Safari bar. It comes in black powdered coated steel or shiny stainless steel. I live on the coast so the stainless steel is appealing but I'd probably plastic-dip paint it black to keep it lower profile. I don't have front sensors or cameras, etc. Does anyone have one on their Ex? Has anyone plastic-dip painted a stainless steel bar? How is the durability? Here's a pic from Westin of the Safari Bar on an Ex with lights (but not the style I might choose). The second pic shows that there is no loss of ground clearance which was on of my preferences. Saw that. The ones I'm looking at are smaller diameter tubing and lower profile. 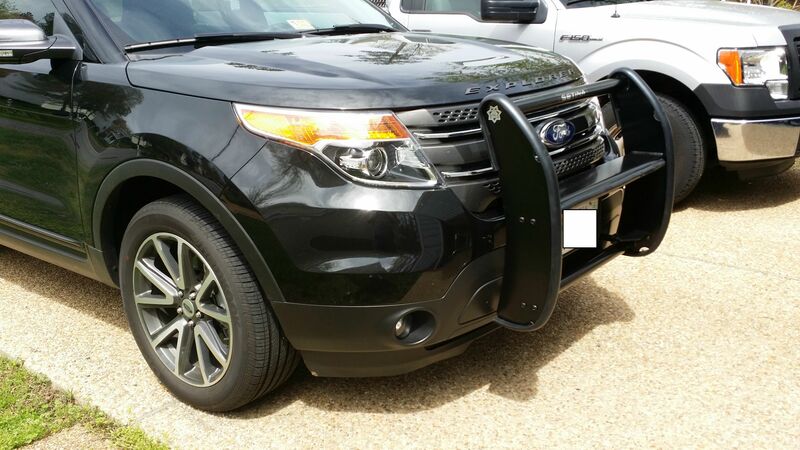 I'm wondering if a brush guard, grille guard, bull bar, push bar etc., would interfere with the front sensors used for parking and adaptive cruise (or any other features)? I tried searching the forum, but didn't find a definitive answer. I really want to add one, but the wife relies on the features that might be affected. Check out posts 49 and 51 for the answers. Can you repost the photo referenced here? It is no longer available. The Setina, by the way, can be ordered with strobes or without, the strobe controller being built in, making wiring simple.. The no-police option strobes can be amber or white. Basic PB400 (no lights) runs a bit under $300, with strobes about another $200. I did have my DRL activated. The lower round LED is wired to the DRL bulb wiring directly. Glad to be of help. Come visit the islands one day. You said the "no-police option"...are you saying we can order the PB-450-L with the white strobes? Or is there a PB-400 with a strobe option? I ordered my push bar back in December, and received it around the beginning of February. I was going to pay to have someone put it on, but finally decided to do it myself. I finally put it on yesterday, and it was a lot easier than expected. There were 7 10mm bolts up top along with 2 push pin type retainers. On the bottom, there were 9 or 10 8mm bolts to remove. There were 6 really small bolts to remove at each front tire. 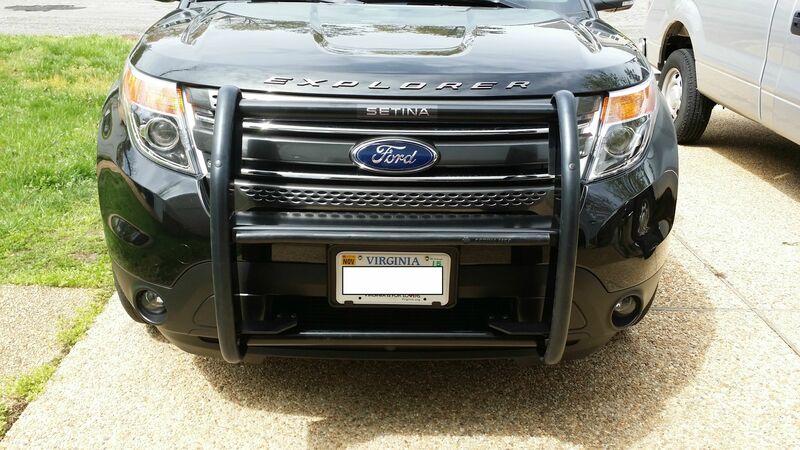 The grill and bumper can come off together as 1 piece. Yours looks real nice! I have a 2016 Sport, all black like yours. Based on the forum, I will be buying the Setina with White Strobes. ........Yours looks real nice! I have a 2016 Sport, all black like yours. Based on the forum, I will be buying the Setina with White Strobes. Just be aware that it will interfere with your front sensors, if you have them. See post 49 and 51 as explained in post 250. I'm interested as well with a '17. I don't know if disabling just a couple of sensors is possible. A push bar may also affect the function of the Adaptive Cruise Control and Forward Collision Warning with Brake Support if you have that. No AAC or Forward Collision, just the parking sensors (which are very nice). I just like the look of the Sport with the push bar. I figured it wasnt possible, I am surprised that there isnt a way to relocate them to accommodate the push bar. It would be awesome if Setina made a kit that would allow someone to move the sensors to the push bar.